buses. It was a 4 hours journey and the bus fare was only 15 or 20 rupees. 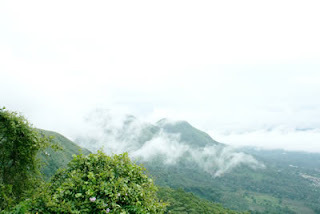 Alternately you can hire a cab from Coimbatore to Ooty. The cab drivers were asking for 1200 for the cab - If you are many people, you can share the fare. We reacherd Ooty and stayed at Hotel Darshan. Have given the contact details of the hotel in another blog post. Serach for it on the blog. 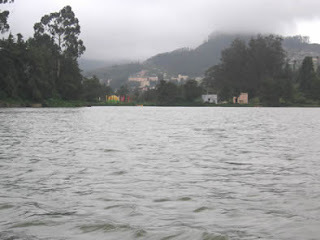 A lovely place just on the edges of the Ooty lake. Very easy to go boating. 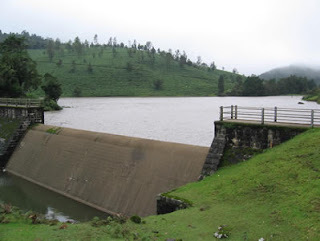 We stayed in Ooty for 2 days. Visited the Botanical Garden, the Thread Garden, went boating on the OOty lake, shopped for tea, essential oils and spices. The weather was pleasant with a slight drizzle. We then hired an autorickshaw to take us from Ooty to Mudumali Wildlife Sanctuary. 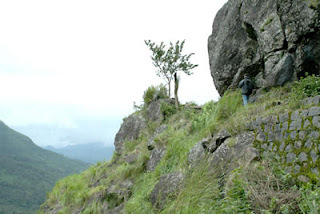 We planned to make Gudalur our base camp and visit Mudumalai. waterfalls, Kamarajsagar Dam, Pine forests, Eucalyptus forests, Golf Course and a few scenic view points. The best being the Frog Hill view point. At Gudalur we put up at Jungle Home. 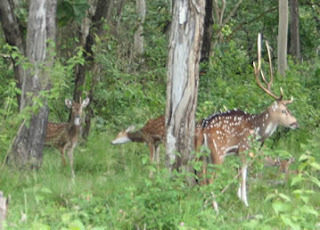 It is on the edge of the Mudumalai Wildlife sanctuary and was a nice place. They had goose, fowl, rabbits, pigeons, turkeys and some other exotic birds on the premises. 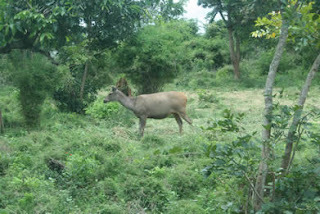 The Jungle Home owner arranged for a night safari where we spotted - bison, elephants, spotted deer and sambhar deer. The next morning we went for a jungle safari. There are bus saafris conducted by the Wildlife Department. Bus frequeny - every half an hour. The ride is for about 45 minutes or so... spotted some animals again. 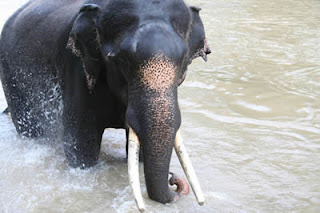 There is an Elephant camp in the jungle. We saw some elephants from a very close range there. There are some jungle huts within the Jungle, for which prior booking has to be done with the Wildlife departnent of Mudumalai. The Mudumalai Wildlife sanctuary is contigous with the Bandipur Wildlife Sanctuary in Karnataka and the Wayanad Wildlife Sanctuary in Kerala. 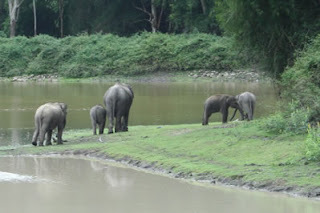 Our return journey was from Mudumalai to Bangalore by bus - the route is through the Bandipur Wildlife Sanctuary and we spotted a lot of animals on this route too.